We're pleased to bring you the official 09/10 Nike home/away range for FC Barcelona. 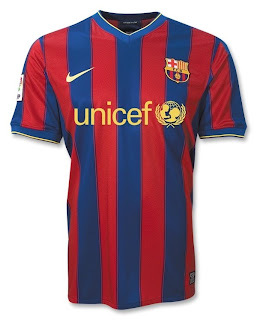 Barcelona 09/10 Home Soccer Jersey. The new home jersey design hearkens back to the traditional navy blue and claret vertical stripes of bygone glory years. Moreover, it's edged with a thin yellow line, a V-neck, sleeve borders with a subtle black and yellow stripe, and the Senyera, the Catalan flag, on the back collar. Finally, a label is sewn on the inside of the neck with “Més que un club” (More than a club). 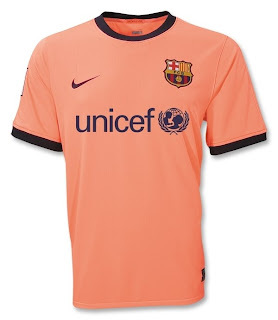 Barcelona 09/10 Away Soccer Jersey. The new away shirt is a bright mango (evoking the Mediterranean Sea) with a round neck and blue trim. Both jerseys are made of Nike Dri-FIT® - advanced material designed to absorb sweat allowing the player to feel dry and fresh as long as you wear it. The three-dimensional architecture allows a greater circulation of air around the skin which also prevents the shirt from sticking.